You are here: Home › News › Boxed In! This is the story of a family that has lived on the banks of the Milwaukee River for more than 100 years. As the curtain goes up on 2006, Earl and Dolores Lazenby wonder how much longer they can remain on the beloved stretch of riverbank they have called home. Her father ran a successful business selling live bait. In the days before fly-casting and artificial lures, most fishing was done with minnows. Eddie Kasal could harvest plenty of those right from the river. He sold wholesale to customers in northern Wisconsin, Illinois and Minnesota; he sold retail right from the front of his house. For more than five decades, Eddie Kasal supported his family from the bounty of the river. Dolores went to Holy Rosary School near Oakland Avenue. St. Hedwigs and St. Casimirs were both closer, but those parishes were mostly Polish and her mother identified more with the Irish enclave on the East Side. Graduating from Messmer High School, she joined the Navy in 1943 and met Earl while she was in the service. The couple was married in November 1945. In their ranch-style house built with large bay windows to take in the scenery in three directions, Earl and Dolores raised their family in an idyllic spot. The riverbank was not without its own particular dramas, though. They remember how bodies would float down when the ice thawed every spring and when there were drownings. Their driveway would be jammed with investigators and rescue squads trying to drag the river and remove and identify the bodies. Earl took steps to widen his driveway so as to allow more room for the rescue vehicles that needed access to the water. Always there was the fishing. Perch had been abundant in Eddie Kasals youth, but they began to die off when the DNR introduced salmon to the lake. At first people would come in droves for the salmon, not for the meat so much as for the eggs. They would park their campers all along the riverbank and snag hundreds of fish as they swam upriver in the fall. This was before there were regulations that prohibited snagging. Earl recalls seeing the riverbank and parking lot behind their house covered with fish entrails, as people from as far away as Iowa and Tennessee would gut the fish and strip out the eggs, which they could then sell as premium fish bait on inland lakes. One scheme for controlling pollution was to flush the river. Way back in the late 1880s, before there was any system for treating wastewater, the river was visibly polluted. The City of Milwaukee funded an ambitious flushing project that consisted of an enormous pump at the intake site along Lake Michigan  now the site of Alterra Coffee on Lake Drive , which connected through a tunnel to an outlet just downriver from East Kane Place. This system operated until 1985. The Lazenbys remember watching as the relatively clean lake water would flush the contaminated river water that flowed past their house. It would look so pretty and blue! Dolores remembers. 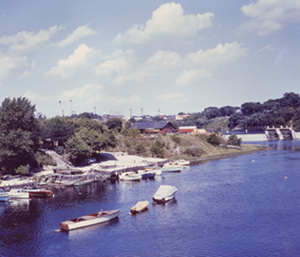 As far as they recall, the flushing was done regularly throughout the warm months, and especially when city officials wanted to show off the river to out-of-town visitors. So as this new year begins, Earl and Dolores have a huge condominium going up in their front yard. Next year they expect another condo development in their back yard. Where the land around them used to be a wooded riverbank, there will soon be pavement, cedar chips and pre-fab landscaping. But both he and Dolores are realistic about the pressures that are bearing down on them. They are alarmed at how their taxes are going up  $70,000 was the increase in last years assessment. Were afraid were going to get taxed off our land, they admit. Lately Earl and Dolores find themselves thinking a lot about the Native Americans. They have a new understanding of how the natives might have felt when they were surrounded by a wave of aggressive newcomers, how disheartening it must have been for them to watch helplessly as their traditional habitat was destroyed. It is no comfort whatsoever to the Lazenbys to hear how they are sitting on a gold mine. They are not looking for some developer to come along and offer them a bundle. Theyd much rather have the peaceful seclusion they were used to. They took it for granted that they could live out their days at the rivers edge just as their parents and grandparents did. Dolores says she doesnt want to be a whiner, but she doesnt like the changes she sees. She has lived quietly for more than eighty years on the edge of the Milwaukee River, but now she finds that she and her husband are at the very epicenter of the demographic shift taking place in the Riverwest neighborhood. Talk about development or gentrification or the spike in real estate prices that have characterized our local economy over the past decade. Down by the riverside, Earl and Dolores Lazenby are dealing with it all. Looking out past bare trees to the ice that has crusted over the river, Dolores hears the churning of a cement mixer in the background. She wonders about the future.